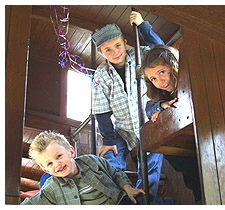 Are you planning on throwing a train party for your child and want it to be simply unforgettable? Well, if you happen to live near San Jose, California, look no more. 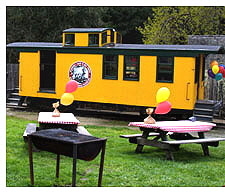 Just about the best place in the country to have a train party is less than 40 minutes away from San Jose and just up the hill from Santa Cruz and its great Beach Boardwalk -- It's called the Roaring Camp Railroads. Sure, the miniature train at your local park is a great time, but imagine riding a real 1880s steam engine through a redwood forest and having your party in a real caboose. It just doesn't get much better than this! 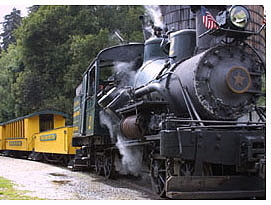 Roaring Camp is actually more than just a railroad. It's a recreation of an 1880s railroad logging camp complete with a general store, a Red Caboose snack stand, Chuck-wagon Barbecue, authentic one-room schoolhouse, a large meeting hall and old-time opera house, ponds, ducks, geese and the smallest covered bridge in California. You cross the covered bridge by foot, and stroll along an old country path leading up to the town, taking you back into time, a time when California was simple and fresh. As the path curves, you enter the town and find yourself smiling a lot. You remember how much you loved trains when you were young, and this visit to Roaring Camp just brings back all those wonderful memories. The party caboose is set up at one end of town next to a grassy area. A half dozen picnic tables are nearby. Although you can bring in your own food, Roaring Camp can set up three different catered parties: at the party caboose, inside an 1849 miner's tent or at a one-room schoolhouse. 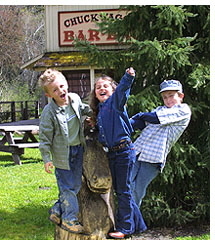 If you prefer to keep things simple, your guests can visit the Red Caboose snack stand or chuck-wagon barbecue right next door. 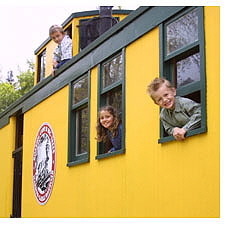 Be careful not to get too comfortable in the caboose because this party package also includes a trip on the train for the one-hour ride up Bear Mountain and back. In fact, you can even arrange to have the party caboose picked up by the train and pulled up the mountain with the whole party aboard! There are lots of options and the folks at Roaring Camp want to help you plan the party that's right for you. Have you ever wondered what it looks like inside a caboose? Here's your big opportunity. All you have to do is get past the kids who have probably taken it over as their new home. Once the kids have gotten aboard the caboose, they are off on a imaginary trip to somewhere they only know. The caboose is equipped with a little built-in table, windows and a small upper area, also with windows, that the kids can get to by climbing up the ladders inside. Once the kids head into the caboose, don't expect to see them come running back to you for attention. They're going to be gone for a while. If you're short on ideas for favors, the camp store has plenty to choose from. There are engineer's hats, wooden whistles, books, snacks, shirts, penny candy and just a lot of old time knick-knacks. If for no other reason, simply stop in the store and spin a few yarns by the pot-bellied stove with some of Roaring Camp's other visitors. 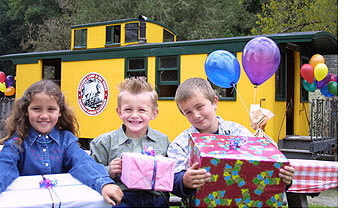 Once you finish your party time at the caboose you get to ride the train up the mountain and back. And this is one ride you won't soon forget. First of all, just riding on an old time steam train is fun enough, but mix that with the fact that you get to travel through a beautiful redwood forest with one hour of chugging and tooting surrounded by forest and friends and it's easy to see why this is one special birthday moment that all will cherish forever. This ride is truly special as it winds through the forest within inches of trees and hillsides (check out the cool video clips above), as your engine shouts, "I think I can, I think I can, I think I can!". It even crosses a real wooden trestle and switches tracks at the top of the mountain by backing up a railroad switchback, just like they did in the 1880s. Along the route, your conductor tells you about the history of the trees (the very first coastal redwoods preserved in California) and information about the train. Don't forget to stop by the cab and meet Engineer Kent after the ride to say hello. 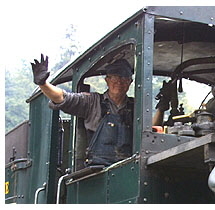 There are very few steam engineers around these days and Roaring Camp has some of the best. Even if you don't live near Roaring Camp, having a train party is about the best thing you can do for your young train lover. There is something magical about trains and the memory you will share forever is worth most any price. To find a tourist railroad near you, check out the railroad links in the right margin of the page or simply search the Internet for tourist railroads and railroad museums. Thanks to the folks at the Roaring Camp Railroads for making my party one I will never forget. And a special thanks to Kati, the Roaring Camp Event Specialist who was so patient and helpful. Truly one of Roaring Camps most valuable assets! If you would like to visit Roaring Camp you can find them on the web at: www.roaringcamp.com, by phone: (831)335-4484 Fax: (831)335-3509 or by mail at: P.O Box G-1, Felton, California, 95018. Be sure to check their events calendar for special days and festivals. Moonlight rides and dinner trains are also offered. "She'll be coming round the mountain when she comes. She'll be coming round the mountain when she comes.........."